There has been a long-running debate about whether a conceptual approach is better for teaching mathematics or whether teaching procedurally is superior. The debate divides mathematics educators into two opposing camps - the proceduralists vs the conceptualists. The arguments from each camp have tended to be mutually exclusive. This article shows why this long-running ‘Procedural vs Conceptual’ debate - i.e. that either one or the other is superior - is flawed. Below are nine key points which shed some light on why we can no longer argue that the ideal approach to mathematics education is either procedural or conceptual, that a hybrid approach is required and what that hybrid approach looks like. Some of the nine keys require expanding. Links to the expansions are provided throughout. ​Both procedural and conceptual approaches to the teaching of mathematics contain necessary prerequisites in order for students to be successful with high school mathematics. The necessary prerequisite to learning mathematics which is best provided by a quality procedural approach is the explicit teaching of routines and procedures. The necessary prerequisite to learning mathematics which is best provided by a quality conceptual approach is conceptual understanding in students (students actually understanding what it is they are working on in class). Let me offer a few ‘feet-on-the-ground’ thoughts on constructivism. My take is that constructivism is a description of the process by which most of us learn anything of real importance. By ‘real importance’, I refer to learning something because we have a genuine need for it and so we initiate a self-directed, learning-by-doing path to master that skill. Examples? Learning to sew, learning to build a shed (or house), learning to master the art of gardening, learning to paint and so on. So constructivism could be seen to be learning via self-initiated, practical exploration. I would say ‘Montessori’ is based on the principles of constructivism. Why are we talking about constructivism? I'm referencing constructivism because maths educators often confuse ‘a conceptual approach’ with ‘a constructivist approach’. However, in this article when using the term 'conceptual' we are not referring to constructivism. We are referring to something more prescriptive, more explicit, more directed. The procedural vs conceptual debate is flawed because the common belief (that the two approaches are mutually exclusive) is a misconception. A hybrid approach is possible which includes the essential prerequisites from both approaches - the explicit teaching of procedures as well as ‘enabling students to understand what it is they are working on' (as soon as they start working on it). We need to talk about student engagement. Why? Because unless students are authentically engaged in what they are working on - i.e. immersed in activities, understanding the mathematics and owning their learning - then their ability to learn is severely handicapped. Authentic student engagement is a fundamental pre-requisite for the learning of mathematics. However, despite being fundamental to the learning of mathematics, the authentic engagement of students rarely features as part of the procedural vs conceptual debate. In search of an analogy, I'd say this is as crazy as a team of people discussing an approach to having humans eat more nutritional food without factoring in the importance of taste! So given that student engagement is key it needs to be said that a well-structured conceptual approach is superior when it comes to authentically engaging students - i.e. immersing them in activities, having them understand what it is they are working on and owning their learning. The hybrid conceptual approach is highly-structured, mostly student-centred and conceptually-based but also incorporates the explicit teaching of procedures. It must be (predominantly) student-centred. Yes, it is highly structured. Yes, the teacher still has control over the direction of the learning. But it cannot be driven by the sort of teacher-centredness that drives the procedural approach. The first aim of any teacher using the hybrid conceptual approach is to have students understand what it is they are doing within an activity. The second aim of the teacher - also important but it must FOLLOW the first - is the teaching of procedures. As has already been suggested, adopting the hybrid conceptual approach requires - for many teachers - a different pedagogy to what bthey are used to. Although it is easy to administer once sufficient experience has been gained, the transition requires some time and guidance. The transition requires a paradigm shift in the teachers’ thinking and classroom management. Ideally, teachers making the shift will receive some quality, ongoing professional guidance which requires them to implement a range of well-structured, student-centred, conceptually-based activities. To see what a course looks like that addresses the hybrid conceptual approach check out the 2½ minute video below. Some final points need mentioning with regard to adopting the hybrid conceptual approach. A common misconception is that a conceptual approach to teaching mathematics requires hands-on activities with lots of equipment. This is not the case. A hybrid-conceptually-based activity is NOT synonymous with ‘lots of equipment’. This is fortunate because the successful running of equipment-heavy lessons is extremely difficult with most high school students. The example given when unpacking Bullet #3 (the rounding of decimals) did likely involve some equipment but equipment that was handled only by the teacher and perhaps a few students in conjunction with quality, targeted, Socratic questioning. For students to effectively learn mathematics they need to understand the mathematics they are working on and they also need to learn routines and procedures. Students gain understanding best via a quality conceptual approach. Students learn procedures best via a quality procedural approach. Therefore a hybrid approach is required that combines the best of both. We call this the hybrid conceptual approach. Teachers using the hybrid conceptual approach have as their primary, initial aim to have students understand the activities they are working through. The explicit teaching of procedures occurs as an important, secondary focus. Authentic student engagement is another prerequisite for the effective learning of mathematics. The hybrid conceptual approach provides an excellent basis for the authentic engagement of students because it is highly-structured, student-centred and conceptually-based. The student-centred nature of the approach increases the level of student spread. 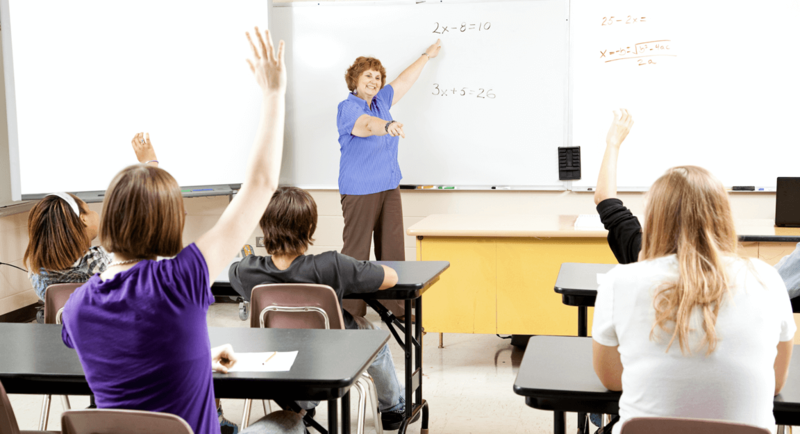 To deal with increased spread teaching segments predominantly occur via mini-lessons. A reason for student-centred learning and the use of mini-lessons is that it is much more effective to teach students some content when they are ready for it and asking for it than to teach the content to them when we decide we need to teach it to them. It is important to know that the successful adoption of a hybrid-conceptual approach (or any conceptual approach) requires a very different pedagogy to that used for a traditional procedural approach. Learn Implement Share has two courses specifically designed to guide teachers into better-engagement of students via the hybrid-conceptually-based approach. ‘Hybrid’ is just for this article! The term ‘hybrid’ has been woven into this article as a way of high lighting that the strengths of the procedural approach can be incorporated into a quality conceptual approach. However, in Learn Implement Share courses, we don’t tend to refer to a ‘hybrid’ conceptual approach - we simply call it a quality conceptual approach which, in our view, naturally incorporates the explicit teaching of procedures. Your input is welcome. It is a massive challenge to attempt to nail down the principles of the hybrid approach in an article. I’d love to know what questions you have, what surprised you, what was new for you, what you have doubts about and so on.